This is my kids FAVORITE way to do math facts/solving addition problems. I teach kids on various levels of addition understanding so this is the perfect way to reach each student within ONE game. 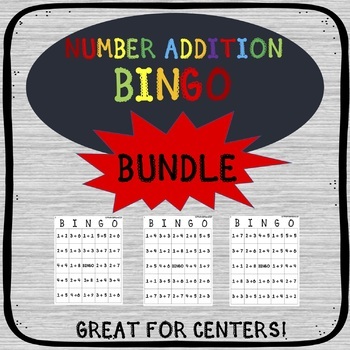 Now ideally, if your using this for a center the majority of the kids would be on the same level of understanding of addition so you could choose ONE way for them all to practice. I print each sheet off and place them in a sheet protector. This way my students can write/erase right on the problem AND it can double as a marker. Make sense?! Not to mention how easy they will be to reuse. WIN! This game also doesn't require many different parts/manipulatives to make the game work for higher levels.